The Great American Songbook of timeless popular classics from Hollywood and Broadway musicals of the past, has and always will be, a source of beautiful music for future generations to enjoy and reimagine in countless ways. 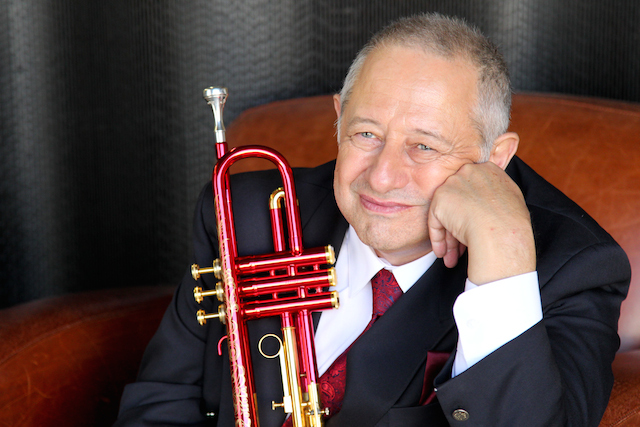 Getting Sentimental, is veteran industry musician Glenn Zottola’s remarkable interpretation of nine immortal standards designed with the trumpet as the lead instrumental voice of the project. “Singing through the horn” has been a common theme for Zottola, to express himself with the lyricism of a great singer who belts out a song with feeling and emotion. Whether playing a ballad or a burner, this is an approach this trumpeter, applies in every performance. Familiar songs from such icons as George Gershwin, Cole Porter, Jerome Kern and others, are delivered here with new treatments that embellish each melody making them sound almost new. While performing various styles of music during his long distinguished career as a professional musician, Zottola’s love of the American Songbook was forged early on as a child. His mother would teach him the songs without sheet music while his father—at one time the arranger for Claude Thornhill’s big band—would rehearse the group in the living room of their home as they played the standards. The music of the ages became an integral part of Zottola’s musical education and this trumpet album, is his “tip of the hat” to the enduring classics. The 1935 Hugh Williams song “Red Sails in the Sunset” opens the album in ballad style as the trumpeter sails through the melody against the backdrop of a string ensemble lending a soft texture to a song revived and popularized by the great Nat King Cole in 1951. For those familiar with the Humphrey Bogart classic “Casablanca,” one will never forget actor Dooley Wilson playing the piano and singing Herman Hupfeld’s “As Time Goes By.” Here, Zottola’s rendition stays true to the time-honored melody and while the piano, once again sets the stage, it’s the light touch of Zottola’s emotional horn-play that harkens memories of the character Sam swaying and singing the song where now, this trumpeter provides the voice. Zottola is superb on “The Very Thought of You,” perhaps one of the all-time classic love songs, this Ray Noble piece has the trumpeter soaring on as few high notes, but is generally experienced as a quiet slow burn infused with gorgeous piano lines and tender strings. The trumpeter follows with a stellar version of Cole Porter’s timeless “In the Still of the Night” with a seemingly improvised beginning that turns into the challenging melody we are all familiar with. This instrumental treatment of the song, with nice accompaniment from the tenor sax and the band, may just be one of the best around. Penned by Jimmy Van Heusen for the 1942 movie “Road to Morocco,” “Moonlight Becomes You” is short but sweet as the laid back theme of the album continues on the title track. Composed by George Bassman, a music writer for films, “I’m Getting Sentimental Over You” gets another gentle take from Zottola who does however, deliver some high-pitched spots throughout the piece, transforming one of the very firsts original performances from Tommy Dorsey back in the 30s as a trombone feature with a Fox trot/swing to, a humbling trumpet feature with a lot of soul. Zottola provides a strong performance on Hoagy Carmichael’s signature song “Stardust,” blowing the horn high and mighty on the medium tempo idiosyncratic melody making this one, the most recorded song of the 20th century. Speaking of oft-recorded standards, who can forget the 1928 George Gershwin classic “Embraceable You,” composed for the Broadway musical “Girl Crazy,” here Zottola returns to the softer theme of the album laying down another sensuous trumpet solo perfect for the lover in as all. Sometimes referred to as one of composer Jerome Kern’s most haunting melodies, “Long Ago (and Far Away),” was written for the 1944 Technicolor film “Cover Girl.” However, there’s nothing truly that haunting on this delicate version, as Zottola plays it beautifully leading the strings with one delicious solo offering after another. There’s nothing hard or boppish about Getting Sentimental, the music is very accessible projecting a warm and romantic mood appealing to one’s softer side. Known for playing an expressive sizzling trumpet who can draw on the power of the instrument when the swing of a tune requires it, on this album, Glenn Zottola reveals himself to be more than a hot trumpeter evidenced by his graceful embrace of gentler material delivered with a solid measure of finesse and tenderness. Zottola stays true to his approach and lays down a heart-felt performance full of feeling and emotion affirming the trumpet voice as a musical messenger of love as well as an excellent interpreter of the American Songbook. Edward Blanco Producer and host at WDNA, 88.9FM in Miami, Florida as well as Critic with All About Jazz magazine.